From a very early age, I adored my grandmother. 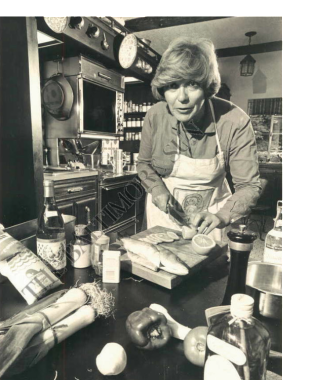 She was fun to be with and always had so many stories – and lots of wonderful food to share. She grew up in a very privileged French-Italian family in Morocco. In 1945, she immigrated to the United States as a war bride. When she arrived in the U.S., she did not know how to be an American housewife. She was accustomed to cooks, tailors, chauffeurs, nannies, and gardeners doing everything for her. The first time she tried to host an American-style cocktail party, she failed miserably. She served shrimp cocktail with a Tabasco sauce for dipping instead of cocktail sauce, among many other missteps. This is when she decided to go to cooking school so she could learn to host incredible feasts back home. She attended the La Varenne cooking school in Paris and became a trained chef. Later, my grandmother helped start a club in Baltimore called The Cosmopolitan Club. Essentially, a foodie club. Every month the members of the club would get together to prepare and eat a feast from another country. My grandmother also wrote a short cookbook on the basics of French cooking and ran a cooking school with weekly demonstrations followed by dinner. She soon developed a large following. Many of her followers, knowing her background, asked her to guide them on food and wine tours of France, Italy, and Morocco. Not only was she an expert in food and wine, but very well versed in history, art, religion, and culture, making her the perfect tour guide. My cousin Lisa and I practically grew up together in my grandmother’s kitchen. We invented a game called Taste Tests. One of us would blindfold the other and place a pinch of spice on her tongue. You had to guess the spice. The cousin who guessed the most spices correctly would win one of my grandmother’s homemade petit pain au chocolat (chocolate croissant). I was lucky enough to live with my grandmother during high school and I got to help her with the cooking school demonstrations, attend her Cosmopolitan Club dinners, and go on amazing trips abroad. My grandmother was a major influence on my life and I remember her with joy and fondness every time I cook one of her recipes. Read an article that my grandmother wrote about a visit with me and my mother to Morocco in 1972.